Rapper Gansta Marcus is proud to announce that he has pulled up in the hood with his first Audi. 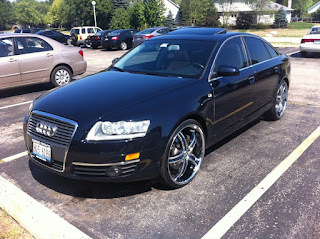 Although many people have reported that this car has given them many problems, the Audi is a great look and ride for me. My 2005 Audi A6 is one of the dream cars I always dreamed of. Next to the 1999 Lincoln Continental, The Audi is a drug dealers dream. The 2005 Audi A6 deserves serious consideration by anyone shopping for a luxurious sports sedan in its price range. The Typ 4F Audi A6 was released in 2004. Designed by Satoshi Wada in 2001, this model is visually an evolution of the C5, but was lengthened to 4,927 millimetres (194.0 in), and has the new Audi "single-frame grille". The Audi A6 3.2 FSI is a saloon (sedan) with 4 doors and a front mounted powerplant which supplies the power to the front wheels. The A6 3.2 FSI forms part of Audi's C6 family of cars. Its 3.1 litre engine is a naturally aspirated, double overhead camshaft, 6 cylinder that has an output of 251.5 bhp.